Asha Truss, an urban African-American schoolteacher, has been fascinated by India all her life. Inspired by a photo of her grandmother at the Taj Mahal, she travels there for the first time and embarks on a spiritual journey. Her quest takes her thousands of miles from north to south, from the mountains to the sea. She faces challenges of body, mind, and soul - and not only discovers a beautiful and ancient culture, but a deeper connection with herself as well. With breathtaking cinematography and soulful music, this film will take you on a visual adventure through India- from the Ganges river, to the Himalayan mountains, to the temples, ashrams, and sacred sites that have enticed travelers and spiritual seekers for centuries. 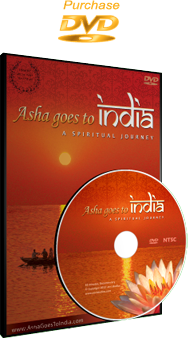 Soundtrack includes music by Prem Joshua, Snatam Kaur, Manish Vyas and many others. Asha first heard about Nadi Astrology through Deepak Chopra, and was immediately fascinated by it. Supposedly, there was a palm leaf in India with her entire life written on it- past, present and future. These nadi leaves were written thousands of years ago by Indian sages and are gathered in various libraries throughout India, the largest one being in Tamil Nadu. Asha searched diligently for her leaf all over India and was surprised by what she found!